Under the theme “Sustainability trends in barrier packaging: towards Objective H2030”, the fourth edition of MeetingPack, a significant technology event on innovation in plastic materials and food and beverage barrier packaging is taking place. 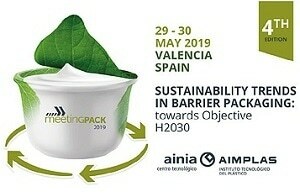 Organized by AIMPLAS and AINIA, MeetingPack2019 is discussing sustainable solutions for food and beverage plastic packaging and more than 300 experts from the entire value chain are expected. From material, packaging and machinery manufacturers to certification bodies, recyclers, food manufacturers and supply companies will attend the event. In addition to a complete agenda, the event is having interesting networking space and exhibition area where the most innovative packages will be showcased. MeetingPack 2019 offers an interesting program divided into five sessions. In the first one, multinationals in the sector will introduce their innovations in packaging materials with which manufacturers could provide added value to their products. Companies like Kuraray and Nippon Goshei, leading companies in the development of biodegradable barrier materials, will participate in this session. Their materials are perfectly suitable to be incorporated in multilayer barrier materials that extend the shelf life of products and avoid waste. In this way, they allow having fully biodegradable barrier packages that could replace the plastic packages currently used for packing perishable food such as meat and fish. The second session will address films, sheets and trays. In this case, companies such as UBE, SP GROUP Plásticos Romero and Klöckner Pentaplast introduce their solutions and strategies to make packages with lower environmental impact thanks to more recyclable and biodegradable materials. They will also talk about how innovation can lead to sustainable packages without compromising on performance. Fundación Plastic Sense is participating in the Ecodesign, recyclability and certification session, where it introduces the RETRAY project, focused on the recycling and recyclability of PET food trays. Ecoembes will introduce Pack CD, a tool that will be ready by the end of this year. It will allow companies to assess the recyclability of their packages.